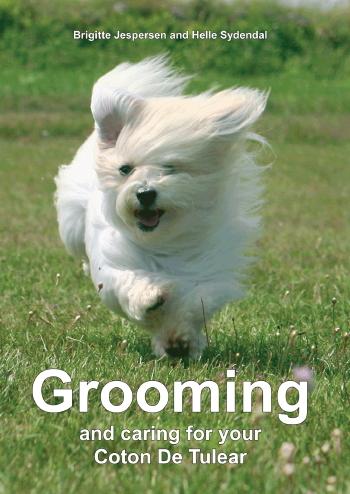 ACC is proud to offer the new Coton Grooming book to all Coton owners in the United States and Canada!! Get those secrets from grooming expert Brigitte Jespersen herself. She is twice World Champion with Bahiya in 2009 and 2011. Now you can learn to groom your Coton De Tulear like an expert. Not only will its coat look so much better, it will also take a lot longer before it gets tangled again. Shipping to America and Canada only. For orders in Europe please click here. Here's a sneak peek inside the Coton Grooming book! 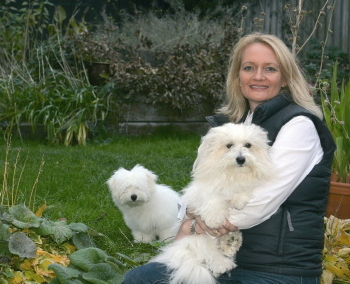 I have been breeding and showing Coton De Tulear for 16 years. Throughout this period I have tried out a lot of different brushes, products and shampoos. You can ruin the Coton coat very quickly, if you treat it wrong and it takes a long time to restore the damage as Coton hair only grows 1 cm a month. It's a shame that this wonderful breed has gotten a reputation that says that grooming is difficult. But I know that this is the way many perceive Coton De Tulear. It's just so annoying. It is also shame that some people give up in advance and dont buy this breed because of the grooming. Many give up and cut the coat. But all the white hair is really one of the charming things about Coton De Tulear. I know there are many out there as Helle. Many people who really wants to keep the coat beautiful, but who do not know how. I am therefore pleased, our book is finished. My goal with this book is to help people who are in despair over their coton coat. I was in despair that I could not keep the dogs' coat nice and healthy. I googled and found nothing only the fact, that Coton De Tulear needs serious grooming. But nothing about how to groom. I got Coton De Tulear because it was the only dog that my allergic son could tolerate. I knew nothing about grooming before I got the dog. But my motto has always been that you should learn something new, you have to learn from the experts. That way you avoid a lot of mistakes along the way. 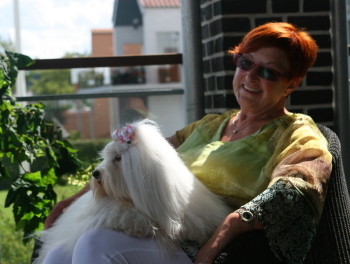 Thats why I contacted Brigitte, when I wanted to know more about the care of Coton De Tulear. She has taught me what brushes are right, and she has shown me way to groom, and she has given me some of her own tricks to get a beautiful and healthy coton-coat. Today, my dogs has a wonderful coat - and I use no more time on care. I just do it right. I've been so happy. and since I am a journalist, I was of course the idea to write a book. And Brigitte would so like to help with that all Coton can get the right care. So now we are writing a book, which can help all the owners of Coton De Tulear, which needs help, like I did. We hope it will be a great help for many who like us love the little white dog with lots of hair.